Vagaries of perception. Temporary constructs of a feeble human intellect trying desperately to justify an existence that is without meaning or purpose. (SPOILERS) Plenty of movies become hugely successful while killing off their protagonist (Gladiator only three years earlier, for example), so that’s definitely not the problem per se with The Matrix Revolutions. No, it’s principally that, despite being filmed back-to-back with The Matrix Reloaded – so ennui on the directors’ part wasn’t a factor – the film feels like the trilogy has run out of steam and inspiration. The most egregious error on the Wachowskis’ part is the decision to double down on the activities in Zion, the real-world component of the movies having steadily grown by this point. Worse, we’re asked to invest in wafer-thin, arbitrarily introduced characters (Kid, Nathaniel Lees’ Captain Mifune) during the interminable assault on the city. In fairness, this isn’t the only area where issues are found. 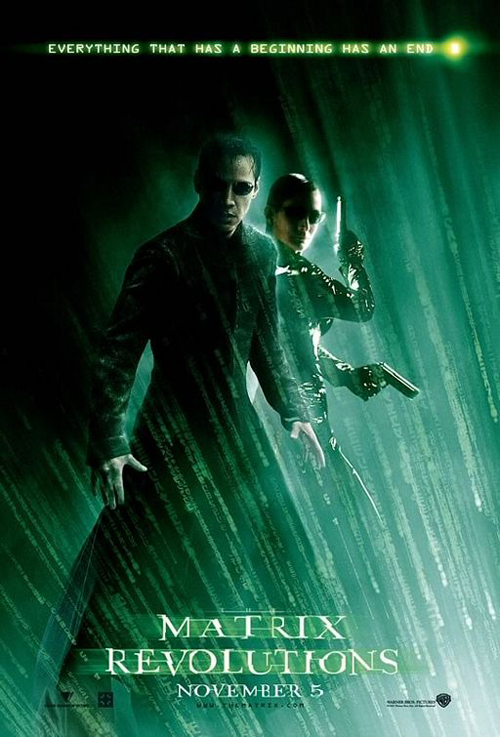 Within the Matrix, the rain-lashed showdown between Neo and a multitude of Smiths (chiefly the one who absorbed the Oracle, a scene that leads to the uncanniest Weaving laugh ever) looks quite nice, but it’s mostly rather uninvolving, because we’ve been here before, twice, and the stakes are accordingly less than compelling. The strengths of the picture, in direct contrast to its predecessor, are front-loaded, and again mostly Matrix-focussed. True, the Merovingian material isn’t as delightful as in Reloaded, and there’s an upside-down shootout that suggests the Wachowskis just aren’t into the action any more (a comparison might be Indiana Jones and the Last Crusade, where you can see that Spielberg just wasn’t feeling it, set-piece-wise). But Neo’s purgatory like wait at Mobile Ave subway station is a nice nod to the “spiritual” hierarchy of the system (if Machine City is heaven, or hell, this is a between state, ruled over by Bruce Spence’s wayward – and therefore in cahoots with the Merovingian – Trainman program). Here, the Wachowskis further indulge their tech empathy, although it’s already a fairly long line of development in the movies, from HAL to the reprogrammed T-800 to Data. Where before it was quite simple – machines bad – now programs may elicit feelings of warmth (the family waiting with Neo). The sisters’ philosophical arrangement of the material requires that an impasse is reached, rather than an outright victory. Smith, a threat to the system (“The result of the equation trying to balance itself out”), must be subdued by a self-sacrificing Neo, himself only the latest in a line of Ones (“The power of the One extends beyond this world. It reaches from here all the way back to where it came from”). They won’t be drawn further on cosmology beyond the tech-spiritual however; the only god in this realm is the appallingly named (not on screen, thankfully) Deus Ex Machina. The movie needed an ultimate adversary, a Borg Queen if you will, but not one as unutterably banal as the sub-sub-Sauron envisaged. As mentioned, Neo is killed off, after being rather rudely blinded. The Bain subplot is a damp squib (or should that be squid?) on every level, and if the blinding serves a purpose (Neo can now see as a machine) it still feels rather perfunctory and anti-climactic, much as Trinity’s death is a waste after her previous deliverance. The siblings’ vision is ultimately a bleak one, even if those who want to leave will be allowed to, allegedly; there is no final defeat, so humanity will remain (at least partially) enslaved, as we here and now really are, in a false light reality matrix. According to some. That isn’t why The Matrix Revolutions fails, though (and it still managed to gross $400m worldwide; it was just a whopping $300m less than The Matrix Reloaded grossed less than six months earlier). It fails first and foremost because it emphasises set pieces and characters the audience couldn’t care less about; the deaths of the leads and the impasse reached only compound the situation. It’s a sad thing when a phenomenon’s legacy dissolves into indifference. Something not entirely dissimilar happened when Back to the Future Part II proved exactly what audiences who loved Back to the Future weren’t expecting (although audiences internationally liked it a lotmore than at home); when the amiable but very safe Part III capped the trilogy, it mustered an underwhelming third of the original’s gross. 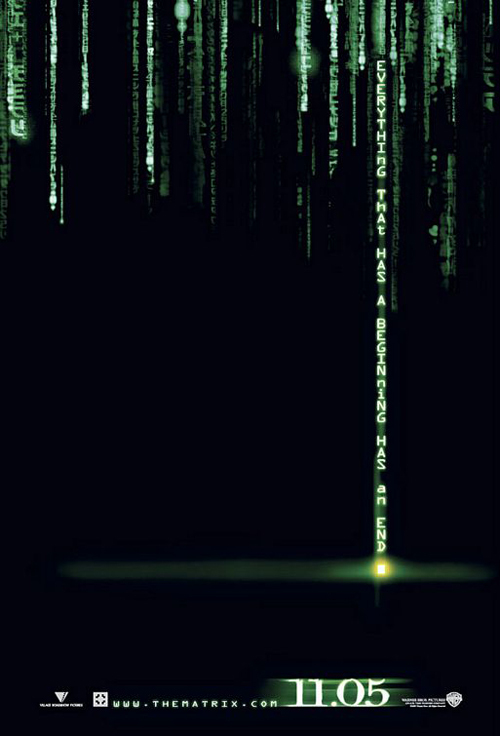 The Matrix had been a cultural phenomenon. The Phantom Menace might have been the highest earner of 1999, but it was Neo everyone talked about (when they weren't complaining about how terrible Lucas' prequel was). The sequels did some interesting things, but even if your positive about them, it’s hard to argue that the precision of storytelling on display in the first was replicated. Whatever The Matrix wasn’t (and its outright naysayers were few and far between), it wasn’t clumsy, clunky or leaden, all of which could be laid at The Matrix Revolutions’ door. Yes, we’ll always have the first one, and you can’t sully that, but how much more satisfying if the whole trilogy had been as refined and polished.